MyBayCity.com Olympic Style Canines to Perform at Labadie Pig Gig! Olympic Style Canines to Perform at Labadie Pig Gig! Presented By State Farm K-9 Classic Dog Show with Olympic Styled Events! The Classic K-9's will be performing at the Labadie Pig Gig presented by State Farm this weekend, on August 1, 2, and 3, in Veterans Memorial Park in Bay City. This family friendly event will astonish and delight both young and old as they entertain with a series of "Olympic" styled canine events including Agility Racing, Musical Mats, Barrel Racing, Relay Racing, World Record Canine High Jumping and much, much more. Every show is different. Don't miss the fun and excitement, all day long! The Classic K9 Show is comprised of many canine antics that are choreographed to music, and mixed with comedy and special effects. Audience participation is mandatory as we enlighten you with fun things that YOU can also do with your pets from home! 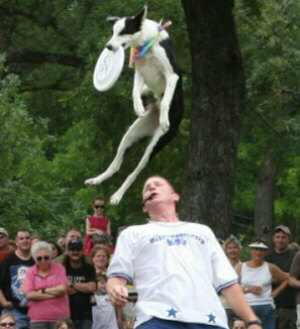 The Classic K9 Show is known internationally as the most enjoyable and memorable canine show for audiences of all ages. The local team for the Classic K9 Show is comprised of our Bay City Training Organization: Kaybees Dog Training of Bay City, Michigan. Sponsors of the Classic K9 Show include Coca-Cola Bottling, Chase-It Pet Toys, Nutro Products Pet Foods, and Band of Mookies Pet Toys, Inc.